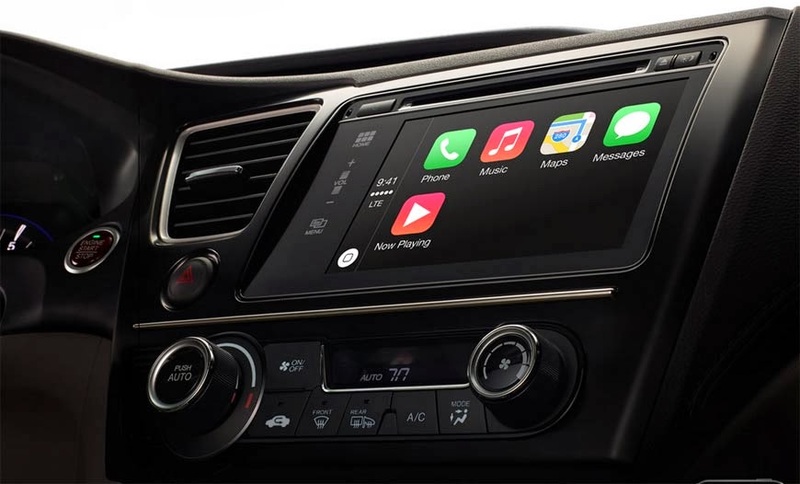 Apple has announced that it will soon rolling out an iPhone update which will enable CarPlay, a feature that will integrate your iPhone to the car’s infotainment system. It allows users to plug their phones into compatible vehicles in order to control entertainment, navigation, and call handling features via speaking Siri-like voice commands and steering-mounted controls. Siri can be used to dial numbers, answer or reject calls, read messages, take dictation, trigger music and podcast playback, and launching apps. So when you connect your iPhone to the car’s infotainment system, Siri starts acting as a mediator between the car’s dashboard and your iPhone. By pushing the voice control button on the steering wheel, you can ask for directions, make or receive calls or even send text messages and Siri will do the needful. Cars with touchscreens will be able to display a customized iOS-like interface, and physical knobs and buttons in the car will hook into CarPlay as well. Directions can be displayed on-screen using Apple Maps, which will include turn-by-turn prompts, traffic condition notifications, and estimated travel time. CarPlay will also be able to predict where you need directions to using contextual data that can already be identified in your phone’s reminders, email, messages and calendar apps. Third-party apps will also be supported, and popular entertainment apps such as Beats Radio, iHeartRadio, Spotify and Stitcher will be functional at launchtime. Apple has not yet disclosed exactly what a vehicle needs in order to be CarPlay compatible. Not all CarPlay implementations will use a touchscreen, but there is no indication yet of what kind of control buttons or layout will be mandatory across manufacturers. The feature will require an iPhone with Lightning dock connector, which is limited to the iPhone 5, 5s and 5c. CarPlay will first be demoed at the Geneva Motor Show later this week on cars from makers like Ferrari, Mercedes-Benz, and Volvo. Later on, CarPlay will be integrated into the infotainment systems of cars from Nissan, Peugeot, Land Rover, BMW, and General Motors among others.